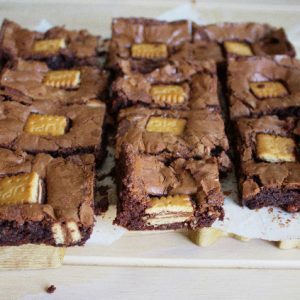 Bahlsen Biscuit Brownies : Deliciously decadent gooey brownies filled with little bites of crunchy chocolate biscuit, with the characteristic papery crust and dotted with PickUp! Minis. Give your brownies a tasty biscuit twist! Every now and again I receive invitations to review new products and recently the lovely people working with Bahlsen Biscuits asked me to sample an addition to their Pick Up! range, the Pick Up! Minis. Since the Bahlsen Leibniz range is an established family treat I was intrigued to try out their new product. As a German family run business, Bahlsen have been making biscuits for the last 125 years and they now support sustainable cocoa farming by using UTZ certified cocoa where the farmers are trained in sustainable farming methods to improve their crop yield and subsequently their income and quality of life. Gauging reaction from family, the individually wrapped Pick Up! Minis were an instant hit, as they remained fresh and crisp. 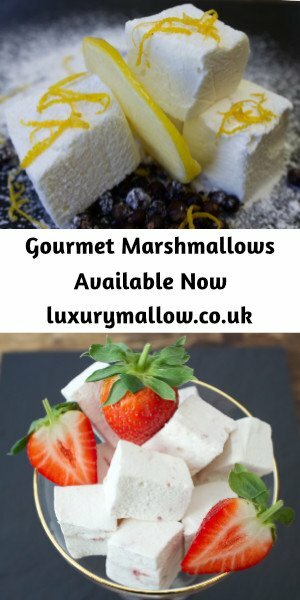 Perfect for popping in a lunch box and just the right size for a quick treat without feeling guilty as the Pick Up! Minis come in at just 164 kcals for three biscuits. Having given out packs of the Classic Milk Chocolate and Choco and Milk, family didn’t really seem to have an outright preference – it appears the deliciously thick slab of filling sandwiched between two mini crisp butter biscuits was equally irresistible in milk chocolate and milk chocolate with milk cream. Quite how we arrived there I don’t know but at some point over the weekend OH challenged me to create a bake using the Pick Up! Minis – before insisting it couldn’t include courgettes ! Regular readers might recall OH’s aversion to courgettes after a particularly fruitful harvest and his subsequent surprise at liking my Courgette Brownies. Pick Up! Minis are available now from Tesco and Waitrose for £1.29. Pick Up! Minis were sent free of charge in exchange for this review. All thoughts and opinions are our own. Bahlsen Biscuit Brownies : Deliciously decadent gooey brownies filled with little bites of crunchy chocolate biscuit, with the characteristic papery crust and dotted with PickUp! Minis. You will need: 23 cm square baking tin lined with baking parchment and greased. Preheat oven to 180℃ / 350℉ / Gas Mark 4. Melt the chocolate and butter in a microwave in 30 second bursts or in a bowl over a pan of hot water and leave to one side to cool. Bash 4 PickUp! Minis into small pieces and cut the remaining 6 in half. Whisk eggs and sugar together until doubled in volume and carefully fold in the cooled chocolate mixture. Gently fold the cocoa powder, baking powder and flour into your mixture, taking care not to remove all the air. 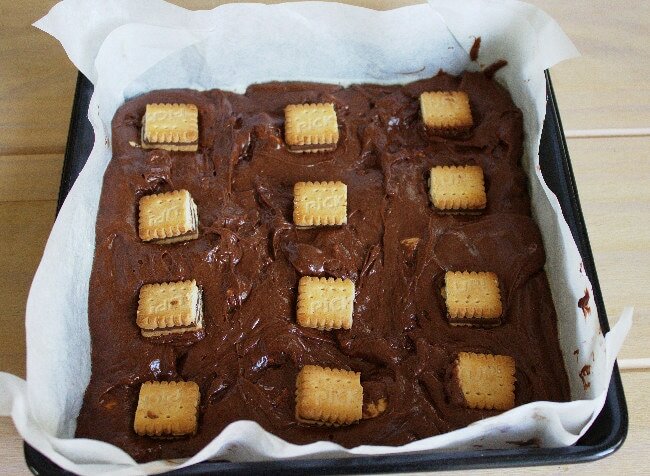 Mix in the broken biscuits before spooning the brownie mixture into the prepared tin and levelling out the mixture. Evenly arrange the 12 halves of PickUp! Minis on the top of the brownie mixture and pop your tin into the oven. Bake for 25-30 minutes until a toothpick inserted into the centre comes out with moist crumbs on it (but no wet batter) and the brownie feels firm. Leave to cool in the tin on a wire rack until cold, then lift the brownie slab out of the tin using the parchment. Peel the parchment off and use a sharp knife to cut into 12 squares. The brownies will keep in an airtight container for up to a week. Corina’s food challenge Cook Once Eat Twice over at Searching for Spice. Choclette’s We should Cocoa challenge over at Tin & Thyme. November’s Treat Petite created by Stuart at CakeyBoi & Kat at The Baking Explorer, hosted this month by Stuart over at CakeyBoi. Love the idea of gooey and crunchy both at the same time. If ever I come across these minis, I’m going to have to try this. Thanks for sharing with We Should Cocoa. Thanks for taking part in Treat Petite. 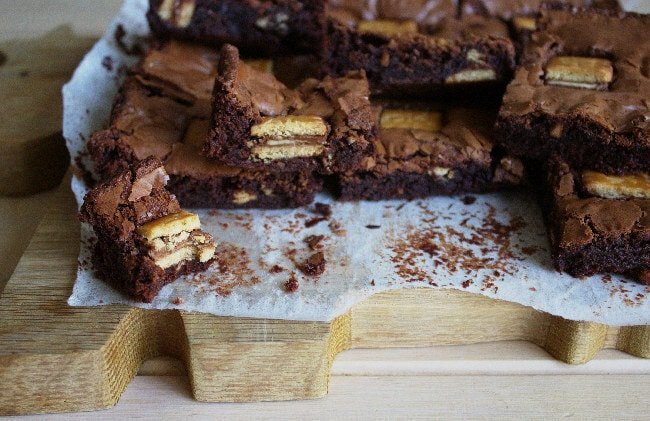 A great use for Bahlsen biscuits – I’ve never had courgette brownies before but I have had spinach ones – a mixed response!! 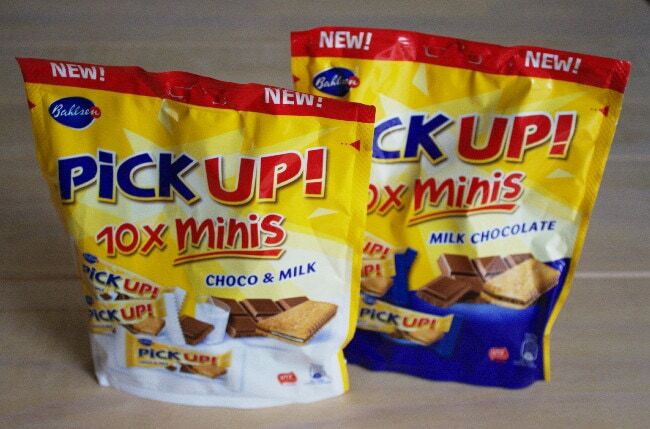 Ooh those pick up minis sounds yummy. We love the full size version in my house, although I have absolutely no willpower when I eat them and have far too many so these little ones would be perfect. 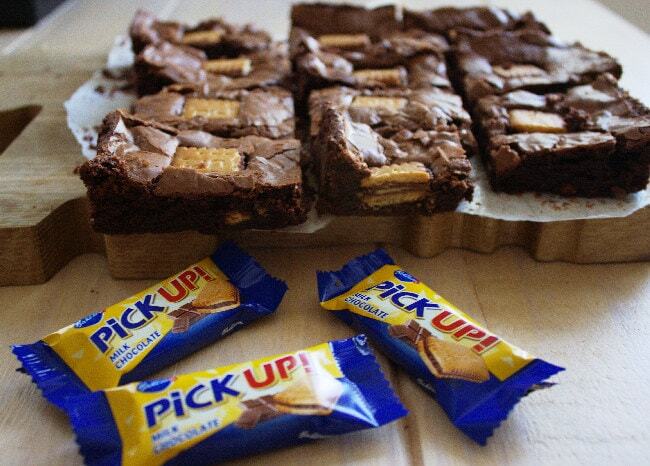 Wow super, my kids love Pick Up they usually take one into school for their snack time so to have one in a chocolate brownie – they’d be in heaven! 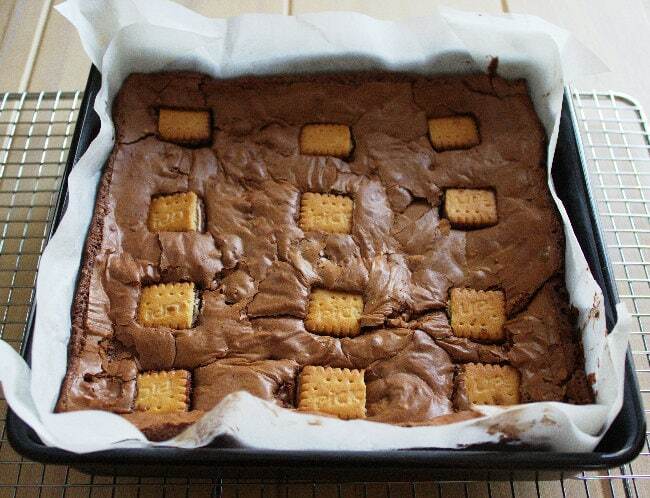 Ooh what a great idea to include the biscuit as part of the brownie bake. They look great 🙂 I must admit I’ve not come across Pick Up biscuits before, I’ll have to have a look in tesco when I’m next there. What a clever idea! I know some people who would love your recipe. I’m not a huge fan of chocolate (shhh!) so I like a biscuit/chocolate combo. Great with a cup of tea! ? Thanks Kat, my sister isn’t a great fan of chocolate either, a biscuit chocolate combo is more up her street too. 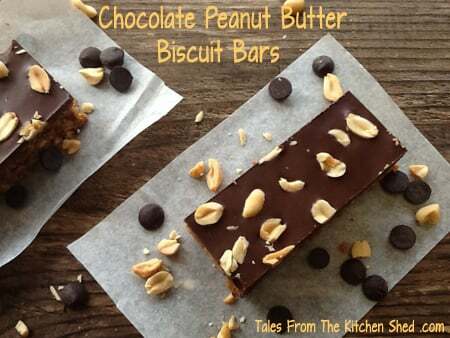 These do look very decadent and maybe contain a bit too much chocolate for me. Although I’m definitely going to check if those little biscuits come in dark chocolate! I love Leibniz biscuits purely because it’s the name of a Philosopher I have to teach about each year so I can bring in a themed snack on that day! These look lovely. As a person who eats biscuits for breakfast every day without fail, these would be right up my street! These look delicious. I often think about what I can make when my niece and nephew visit and I am pretty sure that both would love these. Yum! 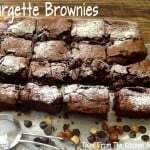 These brownies look so very good! Great idea to bake them with the biscuits! Thanks Elizabeth, the crunch of the biscuits worked so well with the gooeyness of the brownie. I lost my much loved brownie recipe a few months back so am on the look out for a replacement. This is worth trying! Thank you, they look delicious. Yum! 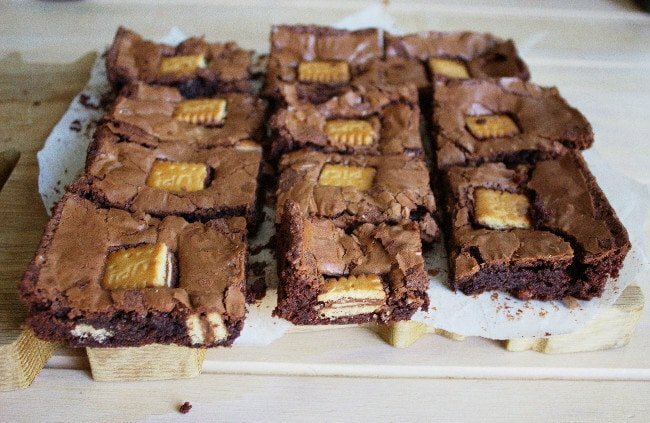 I love Bahlsen biscuits but never thought to make brownies with them thanks for the fab recipe! Brownies are my all time favourite cakes, love experimenting with them too. Your brownies look great. I could eat one or 3 of them now with my cup of tea 🙂 They look so yummy!! Ohh these look really lovely. 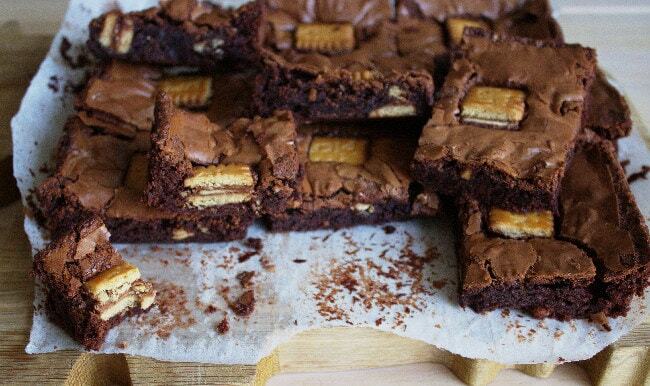 Love the idea of the crunchy biscuit in a gooey brownie Yum! And thank you for taking the time to check my page was working. Thanks Jacqui, the crunchy biscuit is a nice contrast. You’re most welcome. Ooh these look lovely! The hidden courgette success made me laugh – I have the same situation all the time with my kids! Thanks Mandy, OH is just like a big kid, I’m always trying to find ways of hiding veggies in our meals.